For hiking on the trail with your kid, a baby carrier allows you to carry your little one safely, securely and with ease. To keep your child and yourself happy on trails, a safe and quality baby carrier is a must. Some baby carriers are specially designed to help you to go outdoor with your youngster. 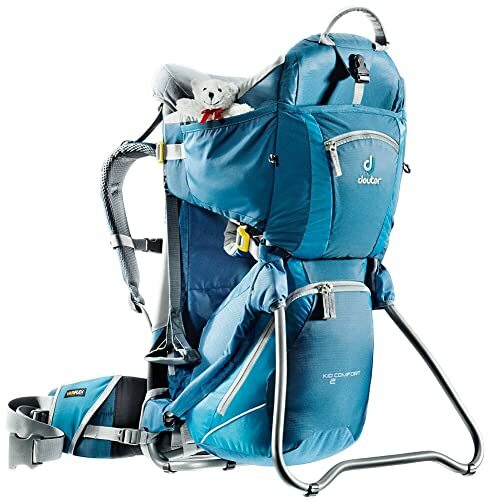 As our goal is to provide you right product information, here we reviewed ten best baby carriers for hiking to make your research process easier. These baby carriers will make hiking with baby fun and easy. Modern baby carriers are built to distribute the weight to ensure your comfort and their designs allow a safe ride. As a variety of hiking baby carrier is on the market, it is tough making the purchase. First of all, you just need to find out your needs. Considering the features, comfort, and safety, below we reviewed the top ten baby carrier of 2018. After reading this article, you will be in a position to figure out which baby carrier is right for your next hiking. 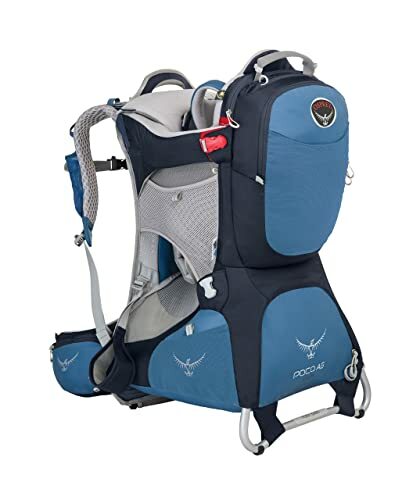 The Poco AG Plus by Osprey is perhaps the best kid carrier for the feature set. The pack has Anti-Gravity mesh backpack suspension system that ventilates well and is easy to adjust. The lightweight aluminum frame provides weight stability and the mesh shoulder harness, and the AG back panel combination keeps you comfortable. Its lower zippered compartment offers storage for diapers and other items. And dual zippered pockets at hip-belt keep essential items readily accessible. The child cockpit is padded, fully framed and the butterfly harness is fleece-covered for your child safety and comfort. The base has a locking foot bar for stability and two large and reinforced grab handles ensure secure pickups. The patented Fit-on-the-Fly hip-belt means parents can enjoy the right fit during the same walk. And they can also share weight with a removable daypack. Other features are a myriad of storage pockets, an integrated sunshade to protect sensitive skin, and a removable, washable drool pad. Its maximum load capacity 48.5 pounds. The Deuter Kid Comfort 2 is a bestselling baby carrier and a favorite of kids and parents. This pack offers side step-in access, a height adjustable seat, a large and super soft chin pad, various compartments and small pockets for parents and has a VariFit system so swapping the pack between mom and dad is as simple as ever. The Deuter Kid Comfort 2 is designed for of boundless freedom on longer hikes. 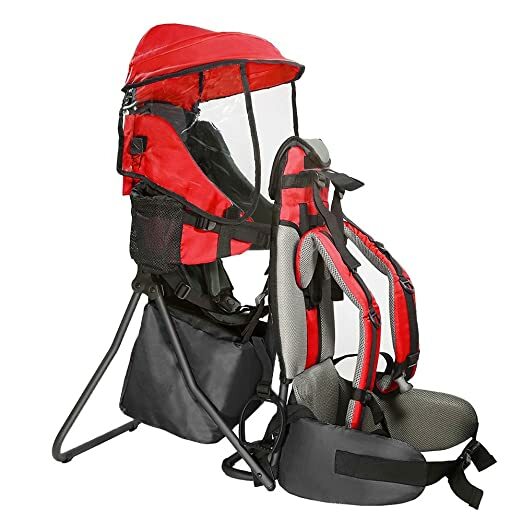 JPMA approved for safety, this baby carrier is ideal for kids who can sit up by themselves. The Kid Comfort 2 is made of MacroLite 210 / PU Coated Super-Polytex which ensures comfort and durability. The pivoting VariFlex hip wings follow your movement, even on uneven terrain. Its S-shaped shoulder straps relieve neck strain. The Kid Comfort 2 baby carrier has 2 grab handles which make pack easy to lift without assistance. It has enough storage pockets and compartments for necessary items. 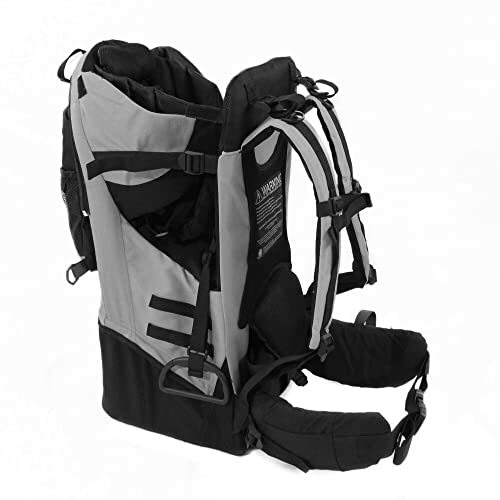 This baby carrier is compatible with 2- or 3-liter hydration systems. The package includes a teddy bear. Weight Limit: 48.5 lbs Weight: 7lb Dimensions: 28 x 17 x 13 inches. This Child backpack carrier is made of sturdy metal frame and 600d oxford cloth. It is lightweight, durable and comfortable and can withstand daily use. The Red Clever Child backpack carrier features multiple pockets, padded waist strap, thickly padded shoulder pads, and two side water bottle holders. It has an extra large back pocket for diapers and necessary items. Across the back pocket, this baby carrier also features a safety reflective strip. And you can remove the Sun/Rain canopy easily at any time. The child carrier features an easy adjustment system for a comfortable fit. Its metal stands allow it to sit vertically on an even surface and can be quickly folded. It also features multiple pockets including two water bottle pockets. It weighs only 5.1 LBS. This is an ideal carrier for children up to 4 years. This brand new Backpack Child Carrier is made of 600d oxford cloth and strong yet lightweight metal frame, it has the ability to withstand the elements and daily use. Featuring multiple pockets, padded waist strap, thickly padded shoulder pads, and two side water bottle holders. It has an extra large back pocket for diapers and necessities. This baby carrier also features a reflective strip across the back pocket for safety. And the Sun or Rain canopy can be easily removed at any time. The child carrier features an easy adjustment arrangement to provide a comfortable fit for wearer and traveler. It has come up with upgraded foot straps for more support. This baby carrier offers more storage and pockets to keep your necessary items handy. It has removable mini backpack & retractable canopy. The included padded straps and hip belt keeps you cool, comfortable, and secure. The metal stand allows the carrier to sit upright on a flat surface. It also allows quickly fold when on the go. This is an ideal carrier for children up to 4 years and max total weight: 40 pounds. This baby carrier backpack is the ideal assistant for busy parents who want to show their kids the great outdoors. As it is soft and cuddly, this is the perfect complement for a child when they need to nap and yet comfortable when peering out over parents’ shoulder out into the wild. For the parents, it is comfortable and ergonomic for long-term use. Retro Scout is suitable for babies from 6 months to 4 years not more than 40 lbs. The RETRO SCOUT hiking baby carrier is the perfect tool for your babies safety and your comfort while enjoying the great outdoors. Features a lightweight external aluminum frame. The metal frame evenly distributes your toddler weight. The included simple travel bag stores the baby carrier while at home. The backpack was safety tested by a CPSA certified lab. If you are not happy with the Retro Scout backpack, you can claim for a full refund including shipping. This product comes with one year warranty on parts replacement a and a 30 days return policy. This new Clevr child carrier is made out of strong waterproof polyester and it has new safety straps for your child. 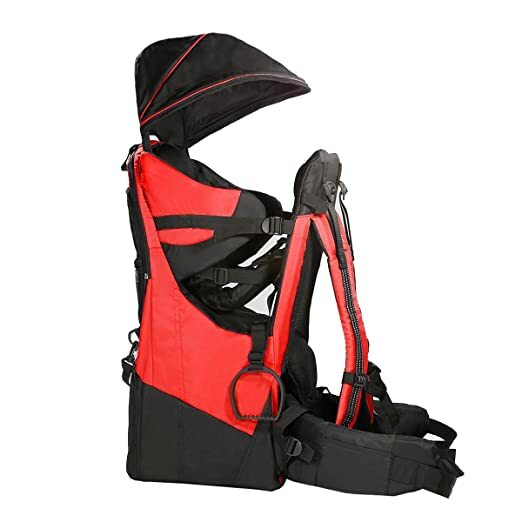 This carrier also includes adjustable straps to fit your youngster more safe and comfortable. New features in this model are extra pockets, a new insulated pocket for baby bottles or cold drinks. It has also come up with a bonus changing pad for a clean surface to lay your child. It has a lightweight yet durable aluminum frame. This new Clevr child carrier has energy-absorbing lumbar padding hip belts and padded straps to keep you fresh, comfortable, and secure. This baby carrier is recommended for children between 9-36 months young. The carrier only weighs about 6.5 pounds. The max weight should be 40 lbs. The Gorilla child carriers are the convenient, comfortable, and stylish option to travel with your children. Comfortably fits child approximately 6 months to 3 years. This baby carrier includes sun shade and rain hood at no extra cost. Several storage compartments for necessary accessories. It has 19 adjustment points for you and your kid’s comfort. Heavyweight waterproof materials were used, and the superior craftsmanship of Gorilla ensures durability so that your carrier lasts for generations. A unique design with extra padding makes it super comfortable that you and your kid need. Reflective strips and double stitching make it rugged and attractive as it is useful. And it is very functional, as it has many pockets and a removable backpack. 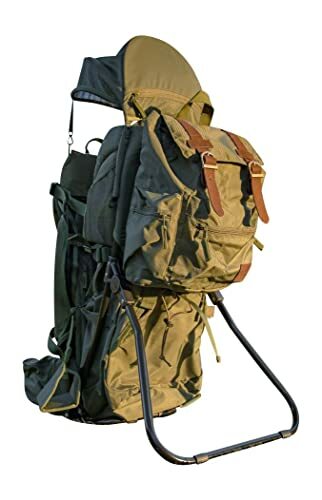 It also features an adjustable foot stirrup for your kid, a 5 Point passenger harness system plus padded shoulder straps and tactical hook loops on the sides. DaDa hip seat baby carrier is designed for all seasons using, it has more than 6 ways to carry babies. This is a perfect option for hiking, traveling, nursing or even doing housework. The hip seat is light and distributes pressure points evenly on baby’s body for baby’s comfort. When you hold your baby, DaDa hip seat keeps your spine straight without any pressure. 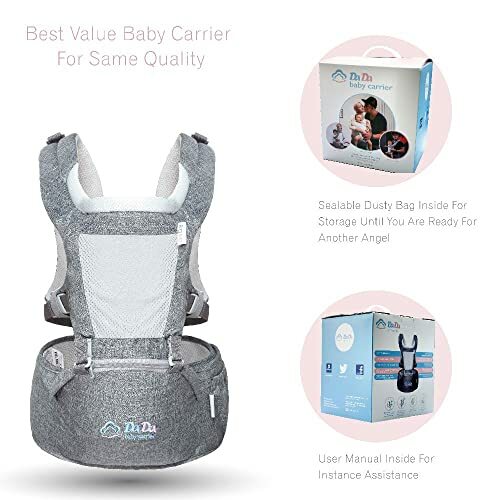 This baby carrier made of sturdy fabric which is machine washable has a top and front cover, and breathable mesh seat for air flow, premium material buckle design, no stain from color. Its adjustable shoulder straps and waist belt fit both mom & dad and fit for babies from 4- 36 months or 7.7 pounds. DADA Airflow 360 baby carrier has passed international safety tests. It has come up with Breathable 3D mesh material for all season use; waist belt side pockets can store small items. New generation Velcro for more secured closure and easy alignment. This Baby Carrier features Baby Hip Seat, Teething Pad and Organic Cotton Baby Drool for all Position Baby Carrier. Your purchase is risk-free as this item covers a 24-month warranty. This item includes Sealing Zipper Storage Plastic Bag, Recall Card, User Manual, 24-month Warranty and Friendly customer service. The Deuter Comfort Air is an excellent child carrier, specifically for hiking in warm weather. This is an independently tested product by DEUTER to exceed state and federal safety guidelines. It has soft padded 5-point safety harness to adjust your child’s size and height. The Ultra-light, breathable, and durable AirComfort system decreases heat buildup without compromising freedom of movement. The AirComfort back system has a flexible steel spring frame that stabilizes the mesh panel for creating ventilation space between the pack and your body. 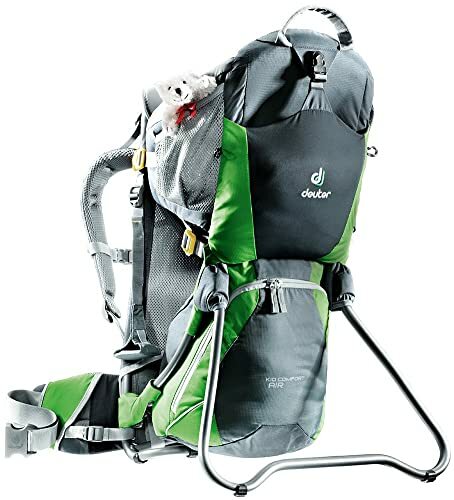 Fit, ventilation, and function are the key factors of the child carriers made by the Deuter. 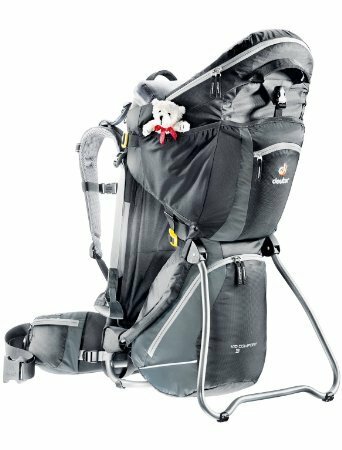 The Kid Comfort Air Child Carrier by Deuter is JPMA certified and are designed for parents looking for ventilated, safe, comfortable and adjustable carriers. Its sturdy aluminum frame offers maximum stability. It has detachable washable chin pad. Compatible with Sun and rain cover. Weight Limit: 48.5 lbs Volume: 14 L. Item Weight: 6lb Dimensions: 28 x 17 x 13 inches. This child carrier is ideal for kids who can sit up by themselves. This item also covers limited lifetime promise. For premium build quality, high levels of comfort and safety, and a competitive price, Deuter’s Kid Comfort 3 is one of the popular baby carriers in the market. 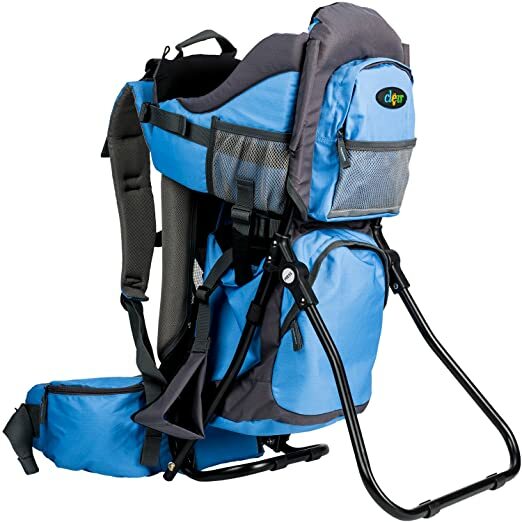 Deuter’s baby carriers are known for their comfort and this model is also notable. Deuter’s Kid Comfort 3 is made of MacroLite 210 / PU Coated Super-Polytex which ensure safety, comfort, and durability. It has soft padded 5-point safety harness to adjust your child size and height. The Kid Comfort 3 is developed with a pediatric specialist to promote the healthy sitting position. The AirContact back system offers a body-hugging fit with unmatched breath ability. Its large open pore structure performs a pump effect, prompts the exchange of air moving moisture and warmth away from the body. Its wide kickstand offers stability when the pack is on a flat surface. It features 2 grab handles makes pack easy to lift, ample storage pockets and compartments, integrated, collapsible sunroof, compatible with 2- or 3-liter hydration systems and rain cover which is sold separately. Weight Limit: 48.5 lbs, Item Weight: 7lb, Dimensions: 31 x 17 x 13 in. Sternum strap stabilizes the carrier on the shoulders. Comfort is really what you want while you are considering a baby hiking carrier. It is extremely vital to remember that a carrier that functions well for someone may not be the best option for you. Our experts recommend that you should try on different baby hiking carriers to determine which one works the best before you purchase. The 10 Best Rain Jacket for Hiking 2019 – Complete Reviews Hiking is a great way to go near nature.